This lovely cupboard unit belongs to our Mariposa Range. This unit makes a great storage solution with 3 drawers and cupboard. Beautifully decorated with flowers and butterflies and simply perfect for modern, contemporary and vintage styled interiors. This cupboard unit makes a fantastic storage solution for the living room, hallway, bedroom and bathroom. Three drawers and cupboard, with internal shelf. This would be great for holding clothes, towels and more. 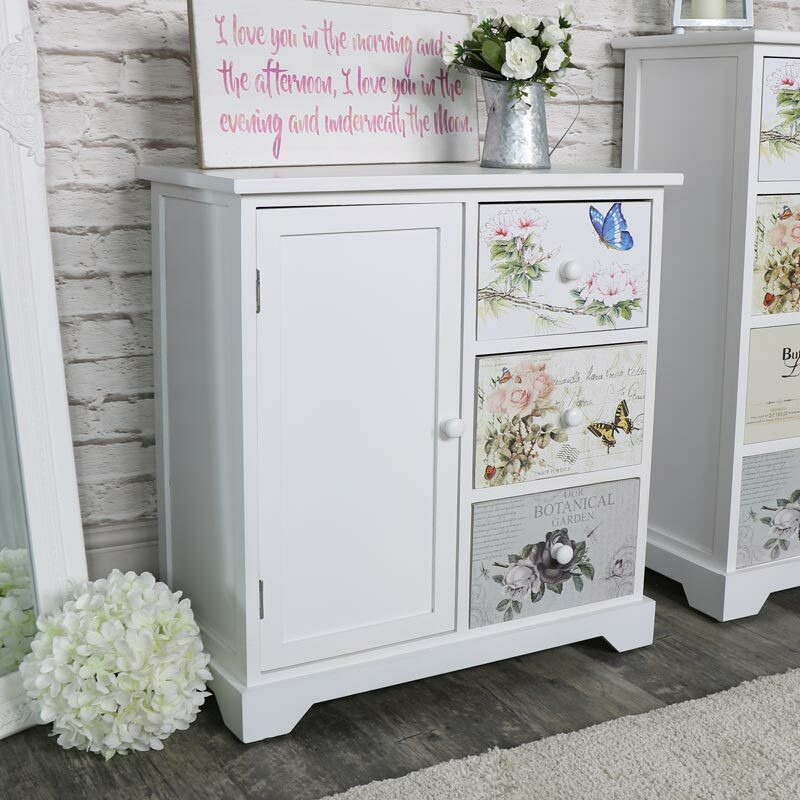 The drawer fronts are decorated with pictures of butterflies and flowers and completed with a round white knob on the drawers and cupboard. Versatile and incredibly practical, this cupboard unit will fit in anywhere in the home and a great companion to the rest of our Mariposa Range. This lovely cupboard unit belongs to our Mariposa Range. This unit makes a great storage solution with 3 drawers and cupboard. Beautifully decorated with flowers and butterflies and simply perfect for modern, contemporary and vintage styled interiors. This cupboard unit makes a fantastic storage solution for the living room, hallway, bedroom and bathroom. Three drawers and cupboard, with internal shelf. This would be great for holding clothes, towels and more. The drawer fronts are decorated with pictures of butterflies and flowers and completed with a round white knob on the drawers and cupboard. Versatile and incredibly practical, this cupboard unit will fit in anywhere in the home and a great companion to the rest of our Mariposa Range. Constructed from wood and painted in white. 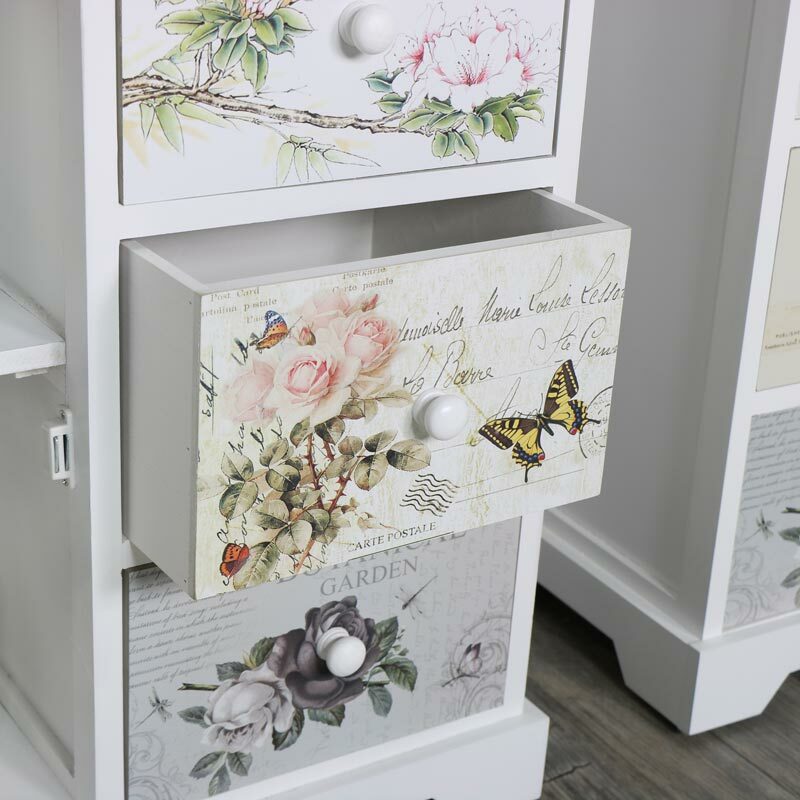 Each of the drawer fronts is covered with prints of butterflies and flowers. The cupboard features 1 internal shelf with magnetic closing to secure the door shut. This unit comes fully assembled and weighs 8kg. With a wide range of furniture available at your fingertips, the Mariposa Range forms part of our wonderfully extensive collection of furniture from the rustic, retro and industrial to the shabby chic, French country style. 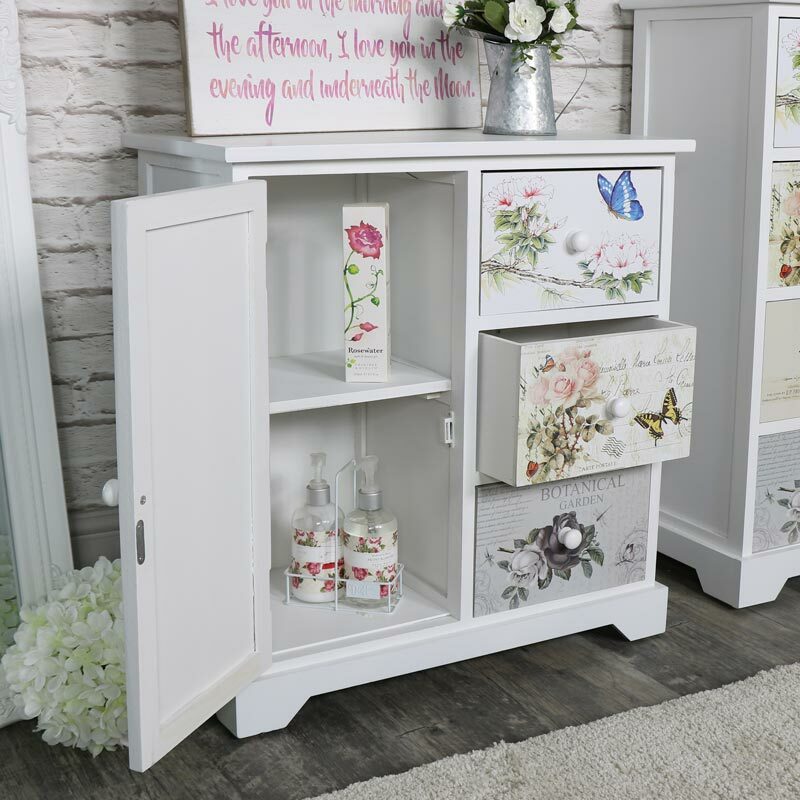 The Mariposa Range White Floral Butterfly 3 Drawer Cupboard Unit is painted in a crisp white colour with printed butterfly and flower detailing on the drawer fronts.